This article has been viewed 10537 times. For over 2,000 years, the Chinese have proclaimed the reishi mushroom as the "medicine of kings". In all those years, the reishi has been called a very valuable remedy for many of the common ailments that are seen in everyday life. Some doctors have even gone so far as to say that the benefits of reishi mushrooms will build a strong body, and ensure a long, healthy life. One of the most common ailments in the world today is the build up of stress. For a long time, Chinese doctors have been prescribing reishi mushroom extract to help combat this and actually lower the stress levels and help release the tension in muscles, thus relaxing the patient. Insomnia patients may also benefit from reishi mushrooms because of the sleep promoting properties. The Japanese will also use the dried mycelium of the reishi mushroom in the treatment of many emotional neuroses caused by environmental stresses. 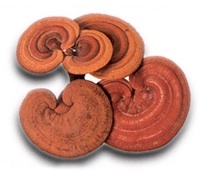 Reishi mushrooms are also known to have cardiac treating properties. It has been prescribed routinely as a way to help relieve that tight sensation within the chest. When the patient took the reishi mushroom extract it would begin working immediately in the blood vessels. Studies revealed that the reishi would improve blood flow throughout the body and lessen the amount of oxygen that was being used in the muscles. As with a lot of different mushrooms, reishi also been reported to have very powerful cancer treating, and prevention, benefits. Studies routinely show that this fungus has highly efficient properties in helping to defeat any cancerous tumors in the body. The major component is called Beta-D-glucan. Beta-D-glucan is a polysaccharide basically a huge sugar molecule made up of many little sugar molecules chained together bound to amino acids. These amino acids then work on a cellular level with the body and helps to ward off any foreign cells, bacteria, and viruses. Taking dried reishi mushrooms daily may help you to not only prevent life threatening problems such as cancer and hypertension, but may also give you a much better outlook on life. You may feel generally better and not have to fight through many of the common viruses.